This door is a medieval style castle door inspired by the Sforza Castle in Milan, Italy. A castle that was built in the 14th century, Sforza Castle was built by the Visconti family and then was owned by the Sforza family as the seat of the Duke of Milan. Both families included a biscone, as serpent, in their family crest. With those family crests in mind, we created this door, including a wrought iron dragon door knocker and large decorative hinge straps to soften the severity of the solid wood door. A large hand forged door pull and protective lock cover finish the door and help to impart a feel of the medieval times. Bring a piece of history into your home with this grand and secure medieval castle door. These ultimate man cave security doors were designed to keep the "horses" in. In this case, those are rare Ferrari Horses (see photos). These custom made garage doors were ordered in time for the great Formula One Race in Austin, Texas. Our instructions were to build castle doors to secure the world's largest collection of rare collector Ferrari cars. Though these luxury cars are fully insured, they are non-replaceable if stolen. We hand built these 5" thick doors and secured them with hand forged, genuine wrought iron fortress locks. These garage doors were custom built in original craft from the historic record, making castle security doors for the modern day. All of our entrance and garage doors and gates are handcrafted in America at our Scottsdale, Arizona factory from the highest quality natural materials. Our wood garage doors are custom made and handcrafted for each client by our talented master level wood workers for luxury and artistry. Order your dream grand entrance doors and security garage doors custom designed for your residential or commercial property, and make a lasting first impression that reflects your personality and accomplishments. 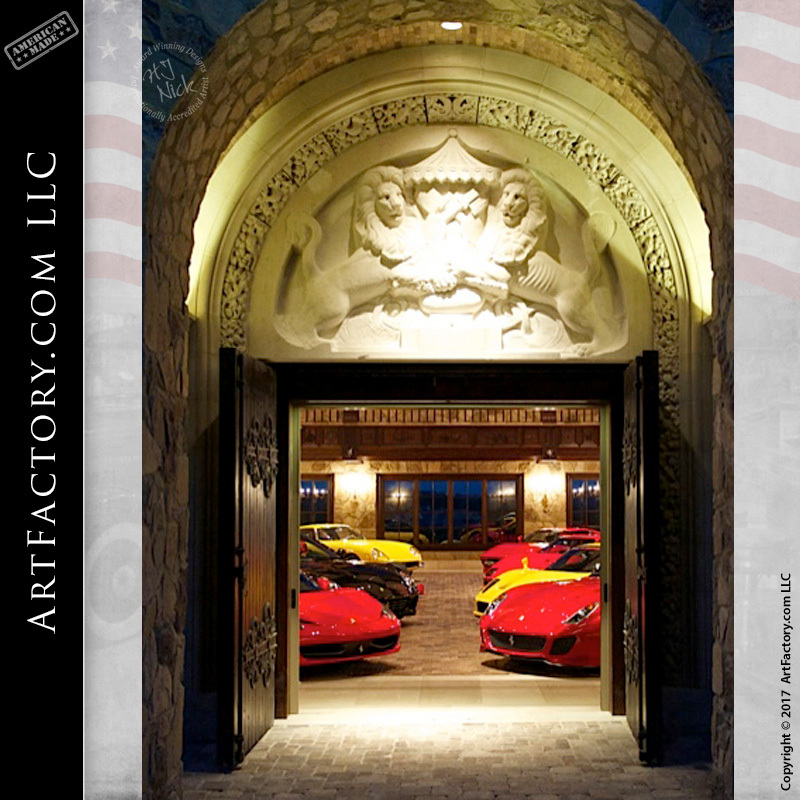 ArtFactory.com offers only the finest signature artistic castle style garage doors, man cave security doors, and more. Custom entrances, individually created by our expert craftsmen, wood carvers, and metal smiths. We have no limitations on size, design, thickness or finish. We hand make interior and exterior doors in any style and size - limited only by your imagination. All our doors are built to exceed hurricane code worldwide and are virtually maintenance free. Contact us to discuss your designer security garage doors at 1-800-292-0008. Castle style garage doors as shown: 5" thick cedar cypress door blade featuring a hand forged dragon door knocker, wrought iron hinge straps, and a custom door pull and lock cover. All custom doors include adjustable heavy-duty crush proof threshold, self-closing adjustable tension hinges, automatic mechanical door sweep, single cylinder deadbolt, and roller style door latches. Porta Giovia, an ancient Roman gate, was incorporated into the structure of Sforza Castle when Galazzo Visconti II built the castle in the 14th century after becoming the Lord of western Milan. In the early 15th century, his grandson, Filippo Maria Visconti, declared this castle the Visconti family’s official residence. When Filippo Maria died with no male heir in 1447, the people of Milan declared a republic and almost completely destroyed the castle. In 1450, Francesco Sforza, once a military leader for Filippo Maria and married to Filippo Maria’s only daughter, Bianca Maria, returned to Milan and overthrew the republic, becoming the Duke of Milan. He began reconstruction of the destroyed castle and that construction continued and expanded once his eldest and then second eldest sons took the title of Duke of Milan. Ludovico Maria, the second son of Francesco, was known as a patron of the arts and invited many prominent artists to build and decorate the castle, including Leonardo Da Vinci and Donato Bramante. He also was the one who commissioned Leonard Da Vinci’s Last Supper. Today you can see the Sala delle Asse by Da Vinci and the Treasure Room that was decorated by Barolomeo Suardi, more commonly known as Bramantino, in the castle. In 1499, the French took Milan and an explosion of a munitions store damaged the castle. When Milan was reclaimed in 1521 by Holy Roman Emperor Charles V, Francesco II Sforza, who married Christina of Denmark at the castle, was granted the title of Duke of Milan and given back the castle. When Francesco II died childless in 1535, he bequeathed the Duchy of Milan to Charles V. The castle became more barracks than residence. The Spanish occupation of the castle is shown by the paintings in the Ducal apartments and the coat of arms painted on the ceiling of one of the rooms, commemorating the marriage of Philip II of Spain to Queen Mary Tudor of England. In 1706, Milan was conquered on behalf of the Holy Roman Emperor Joseph I, an Austrian. The ceilings, frescoes, and stucco decoration of the time of the Sforzas was deteriorating but was otherwise left alone. The Austrian occupants commissioned a statue of the patron saint of the Austrian army, Saint John Nepomucene, which can still be seen in the Courtyard of Arms. When Napoleon’s armies conquered Milan in 1800, the castle continued to be used as a barracks. So it continued after Napoleon’s fall when the Austrians returned to Milan. Briefly used as a prison by the Austrians in 1848 during the Five Days of Milan, once the Austrians permanently left the castle in 1859 it was sacked and looted by the local population. Finally in 1893, a full restoration and reconstruction was begun to bring the castle back to its former glory from the Sforza’s rule. Buildings that were from the 19th century were demolished and areas from the Sforza era that had been destroyed were rebuilt, sometimes needing to refer to paintings and art from the time period to faithfully reproduce the buildings and decor. Today Sforza Castle is home to many artistic masterpieces from the castle and from the city of Milan, and is a great representation of a medieval castle.